Plastic gears used to be found in very limited applications due to the uncertainty around their response to moisture, temperature, chemicals and certain other elements. Today, the true benefits of plastic gears are finally being realized as scientific plastic molding design, material processing and process control are advancing to new levels. Injection molded plastic gears are now being used in electronic & electrical appliances, industrial equipment, the medical industry, the automotive industry & many more. Global demand for plastic gear molding is predicted to experience significant growth worldwide. 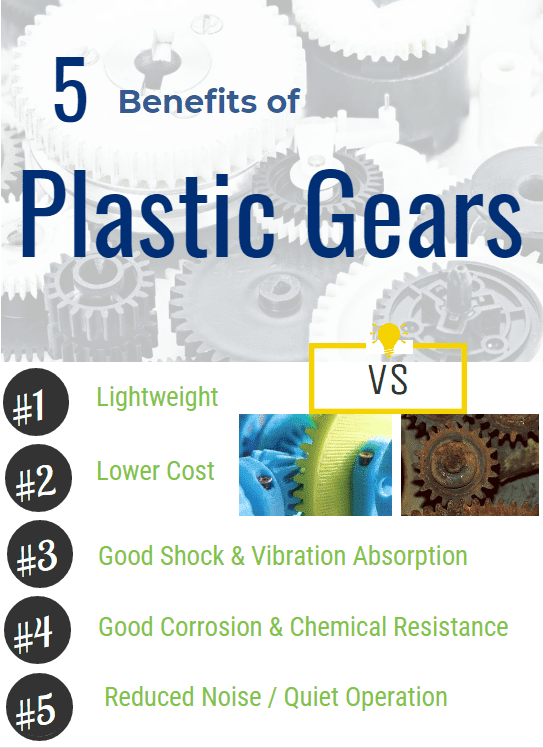 Below are the top 5 reasons why manufacturers are now choosing plastic gears over metal. Contact PMC today to find out if plastic injection molding is right for your gear manufacturing needs.